This new destination club is currently in its "Friends & Family" period as it builds for it's more formal launch this Fall. SherpaReport recently met with Founder, Geoffrey Kent, and President, Jarvis Slade, to discuss the future plans for the club. 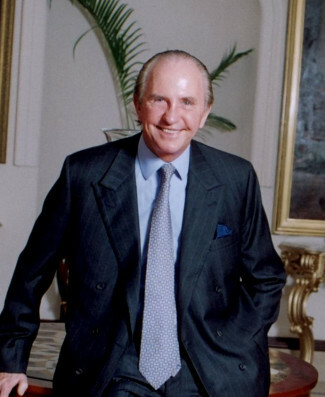 Goeffrey Kent founded his travel company with his parents back in 1962, and since then it has grown to offer unique and bespoke trips all over the world. As you might imagine for someone who organizes the vacations plans of Hollywood celebrities, politicians and world business leaders, he is quite a character. For most of the tours that A&K offers - and nowadays there are 350 tours to over 100 countries - Geoffrey Kent makes sure to try out each one. It certainly helps to keep him in touch with the business, his staff and the experiences that the company provides to its clients. Jarvis and Geoffrey have been on a different kind of tour this summer, as they've traveled the US meeting current members and prospective members of their new destination club - called Abercrombie & Kent Residence Club. SherpaReport met up with them at the Peninsula Hotel in New York. It's certainly good to see how actively involved Geoffrey Kent is in this new destination club, especially given the size of the overall Abercrombie & Kent travel organization that he heads up. His view is that the destination club could eclipse the size of the travel company over time. Since acquiring BelleHavens and Crescendo earlier this year the club has been actively adding new homes, with recent additions in Aspen and the Turks & Caicos Islands. The club is also planning to add an 80ft yacht, which will be based in St Martin in the winter and Newport, Rhode Island in the summer. It will offer three luxurious staterooms plus separate quarters for the fulltime crew. A&K have been planning this new destination club for a year and a half. With its equity model the club plans to be very transparent to members. All the clubs owned homes will be in a separate legal entity which is owned by the members. The operations and management of the club will be run by a separate company, and the club will detail how much of the annual fees and member deposit goes into club homes and how much goes to overhead and management. The club hasn't publicly released its membership plans just yet, but our understanding is that that there will be three plans providing from 15 to 45 nights a year. The clubs current 18 owned homes are mainly in the US, with 4 homes in Mexico and two in the Caribbean. A&K travel has had a European villa rental business for many years and is making 12 of these homes available to club members, providing residences in Spain, France, Italy and Croatia. Club members can also trade their member nights for use at Stein groups boutique hotels around Europe. One of the hallmarks of A&K travel is their "Insider Access". Because of their long history and experience they can provide access to some rather special places and experiences. "What people want is an experience" says Geoffrey Kent "for instance we can help them learn to surf or deep sea fish and we'll have a helicopter available nearby all our club homes, so that the effective travel radius is several hundred miles from the residences." As part of the A&K Residence Club membership a member can trade in some of their nights for A&K tours. Locations such as Africa, India, China, Latin America & the Galapagos have been an A&K staple for many years, but Geoffrey Kent was most excited about the newly launched "Extreme Adventures". He had recently tried the "Extreme Machines" in South Africa combining a supersonic fighter jet flight at 50,000 feet, a race around a Grand Prix track and diving with great white sharks. Only slightly more mundane is an ascent to Everest Base Camp in Nepal or a trip to the actual South Pole in which you trek across the last 70 miles of ice and snow. Some of these trips may be a little too extreme for many folks, but the other 350 tours offer a wider more standard selection to choose from. The larger destination clubs are all starting to offer bespoke tours and travel opportunities. A&K has a long head start in this area, and while this isn't a key reason to join a destination club, it's nice to know that the options are there. One of the many stories and anecdotes that Geoffrey Kent recounted during our meeting was how his early training had been in the armed forces - he had actually spent a lot of this time in a tank division in the British Army. The real relevancy of this story was to convey the level of planning and logistics that Geoffrey and A&K now bring to the travel company and to the new destination club. All this was imbued in the young Geoffrey Kent during his military training. For each A&K tour there is a detailed itinerary that is planned and followed. Many of the finer aspects of this are invisible to the A&K clients, they just see the smooth nature of the tour. Geoffrey discussed how this similar detailed planning process would be applied to the destination club. Each trip, for each member, would be planned in detail to provide the full A&K experience, and ensure a memorable vacation for the members family. This A&K experience starts as a club member arrives and is greeted by the destination host. 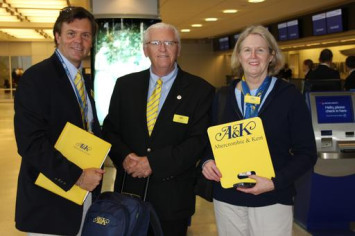 Geoffrey stated that the yellow A&K sign that the travel tour guides hold is a welcoming reassurance when the A&K tour clients arrive in a location. He expected the destination club members to have the same reassuring feeling as they first saw the yellow A&K sign on their arrival at the airport or their club residence. One interesting observation from Geoffrey Kent was how a safari tour is a real family trip. Its not as if the kids can wander off and do their own thing, everyone gets up and has breakfast together and spends a good part of the day together. He compared this to a hotel where members of the family may scatter and not see each other all day (and maybe this is a good way to vacation for some families!!!). His real point was the destination club, with its spacious single family homes, provides a similar structure and a similar family oriented vacation.